CompactHabit was founded in 2004, and is located in “La Cort” industrial complex at Cardona, Barcelona. CompactHabit is owned by Constructora d’Aro, one of the leading construction companies in Catalonia, with more than 45 years of experience on the construction of all types of buildings. CompactHabit was created with a view to solve some of the problems existing in the construction sector. After years of research and development, CompactHabit has opted for the offsite and industrialized construction of volumetric modules that are fully finished and equipped in the factory: the innovative “eMii®” system (Edificación Modular Integral Industrializada or Offsite Integral Modular Building). .
Increasing the level of construction quality. Avoiding frequent deviations in costs and timeframes. Reducing the sector's high accident rate, preventing occupational risks. Improving working conditions for staff. According to these principles, we can state that the company objective goes beyond the simple “manufacture” of homes. At CompactHabit we have the duty, in addition, to ensure the quality of life of the future residents of the homes we build. At CompactHabit our main objective is to innovate in the construction sector to be able to resolve the existing problems. This objective focuses on providing maximum quality and maximum comfort in every building constructed and minimising the environmental impact as much as possible. CompactHabit aims to ensure the well-being of society and collaborate in improving the daily life of some more disadvantaged sectors of the community. This type of contribution to the community is not considered expenditure, but rather a necessary investment for all socially responsible companies; It is a question that goes beyond the economic, it is about people. For this reason, the company intends to participate in diverse social and/or environmental action, to contribute, with this commitment, to generating joint responsibility in housing matters. The company wishes to share responsibility with the government authorities for the production of quality homes that are accessible to everyone. Finally, it is important to note the company's concern for covering the housing needs of young people and quality of life for older people. Since our launch, at CompactHabit we have received awards for our work in innovation and industrialisation. These are notable within a sector as resistant to evolution as construction. 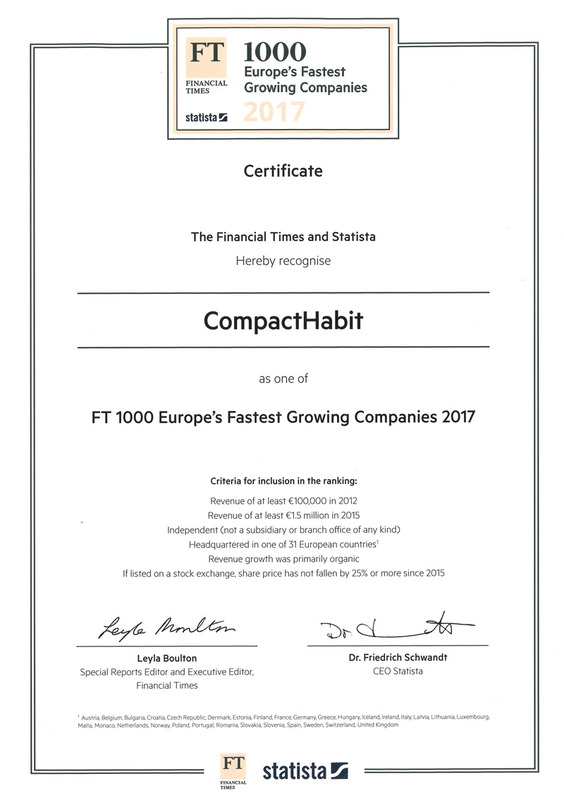 Financial Times recognition as one of the 1000 Europe's fastest growing companies. CompactHabit listed on a Best Practices Report in Permanent Modular Construction. The Pau Student dorm Building awarded in France at "Trophées des Entrepises Publiques Locales, EPL"
Standardization by the North American insurer BakerRisk of the Compact Habit module as blast resistant building with the classification of Medium Strenght Portable Building (MSPB). Finalists in Architecture Category of 2013 FAD awards for the 57 units of student housing in the Polytechnic University of Catalonia in Sant Cugat del Vallès. Best poster award, SB13 Munich Conference– Implementing Sustainability, Barriers and Chances. Special Mention in the Edification category of CONSTRUMAT prizes 2013. Awarded in the “VI Premios NAN 2012 Arquitectura y Construcción” for the best building material in the category of structures, facades, roofs and partitions. Compact Habit S.L. 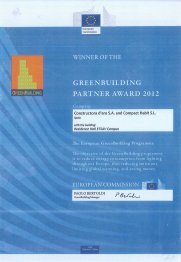 and Construction d'Aro, 2012: Greenbuilding prize awarded by the European Commission to the promoters of the new buildings that stand out for their low environmental impact, energy efficiency and technological innovation. Novabuild Innovation Prize to the eMii system improvements in the Novabuild Fair held in Valencia on 29 of February and 1 and 2 of March of 2012. Josep Tragant – Prize “Pollet d’Or” of Expobages. Recognition and award of the Swiss energy certification “Minergie” for the degree of sustainability and energy efficiency of the university accommodation of Vallès School of Architecture (Universitat Politècnica de Catalunya, UPC). Innovation in Building award by the "Col·legi d’Aparelladors, Arquitectes Tècnics i Enginyers de l’Edificació de Barcelona". (CAATEEB). "Fem Indústria" prize award by the "Col·legi d’Enginyers Industrials de Catalunya" (EIC), and the "Eduard Soler" Foundation. (FES). Selected in the “Gallery of Innovation” at the International Energy Efficiency Fair GENERA 2010. Josep Tragant – Prize “Bagenc de l’any” by the Jove Cambra Internacional de Manresa. Prize for technological innovation, awarded by CONSTRUMAT.